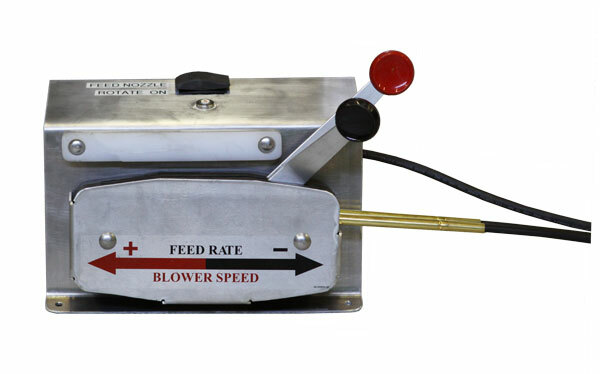 On our smaller model AeroSpreader™ model feed broadcasters, IAS positions front hopper mounted 2 mechanical lever controls to manage both Blower Speed and Feed Rate. As the feed broadcaster grows in hopper capacity and physical size the straight mechanical controls are changed for marine grade stainless steel cable controls that provide the same Blower Speed and Feed Rate control providing the added benefit of placing these 2 lever controls at an optimal position at the feed broadcast hose for best operator control. Similarly when AeroSpreader™ feed broadcasting equipment is ordered for placement on a truck, in a trailer, behind an ATV, or placed on a feed vessel there is an opportunity to order extended cable controls to move these Blower Speed and Feed Rate levers off the feeder to a location easily reached by a remotely positioned operator. Rugged marine grade stainless steel control cables used reliably in over a million marine vessel application. Immediate access and control of feed placement and feed quantity delivered from best operator viewing position. Ensures best feeding and minimum feeding stress needed for optimum feed conversion rates. Cable lengths from 8 to 30ft allow for optimum equipment positioning for best feed spread coverage and at the same time allow for best operator location for best observation and control. For vessel, truck, trailer or ATV applications, extended cable controls eliminates the requirement for a second person to manage feed broadcast while the driver is in motion.